Architekt, Dichter und Dada-Künstler, Mitbegründer und "Oberdada" der Berliner Dada-Bewegung (1875–1955). Collection of 2 typescripts (1 signed), 1 ALS ("Baader"), 1 signed etching, and numerous addenda. Verschiedene Orte. Material dating from Baader's late years, still typical of the author's bizarre world-redeemer attitude. Includes: I. Typescript "Rückkehr zur Mitte" ("Return to the Centre"). 8 ff. With 2 crayon drawings. Large 4to. Bound with an additional typed leaf, dated 8 Nov. 1942, showing that Baader prepared seven copies: one for himself and the others for Hitler, Churchill, Roosevelt, Stalin, as well as the cities of Stuttgart and Hamburg. The present copy is that intended for Schleicher; it is accompanied by an autograph letter by Baader, dated (Hamburg) 10 Nov.
1942: "... The firebomb that visited us yesterday reminds me not to postpone sending off my pieces of the day before yesterday. Write over everything my motto of the years 1918 and 1933: 'Germany is at the sources of the world! And the leaves of the World Rowan sing in the wind: Germany! ...'". - II. Typescript "Der Stern Erde im Atomzeitalter. Ein neues Brevier des Himmels von J. A. Baader" (The Earth-star in the atomic age. A new breviary of heaven by J. A. Baader"). 22 ff. Large 4to. 28 June 1947. 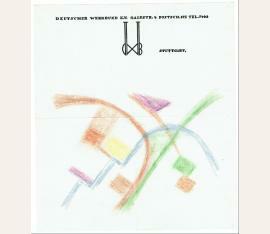 Signed in pencil on t. p. Numerous changes and deletions in the author's own hand. - III. Original etching (255 x 190 mm) showing a leaf bearing the ms. poem "Die Weltreiter"; signed "Baader" in pencil at bottom right. - Addenda: 1 privately printed brochure: J. A. Baader, Der Stern Erde und das Atomzeitalter. 64 pp. 1948. A preprint in 300 copies. - 1 issue of the journal "Moderne Bauformen" (1927) in which Baader has changed the word "Dach" into "DADA" on p. 9. - 7 ff. 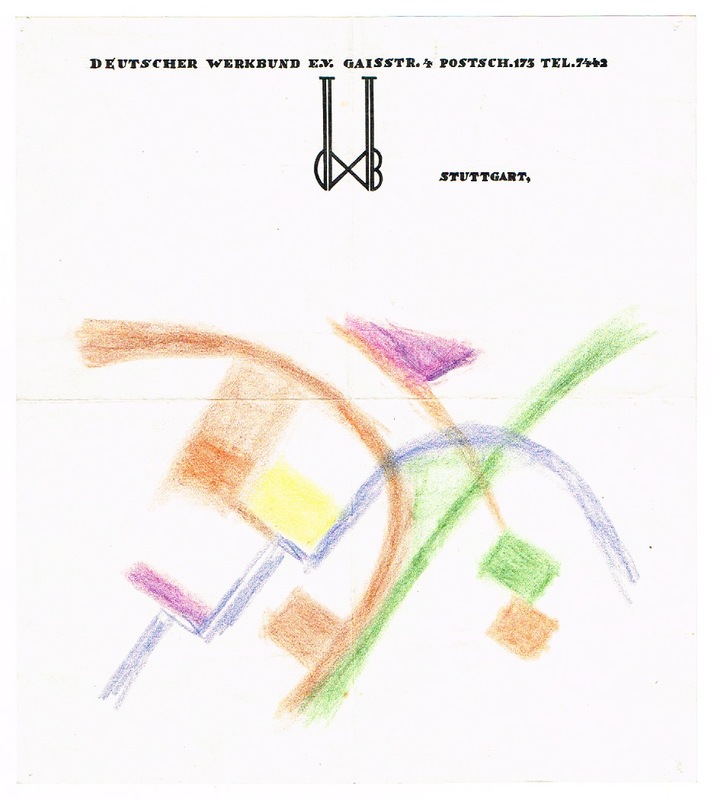 of original construction drawings in various sizes (crayons, watercolour, pencil, charcoal), one of which is on a sheet bearing a design for the letterhead of the "Deutscher Werkbund e. V., Stuttgart". - 1 large charcoal and crayon drawing of a refugee trek, probably drawn in near the end of the War. Unsigned and not positively attributed to Baader. - 13 ff. from old astronomical journals, apparently consulted by Baader for his cosmological theories. - Fascinating working papers by the self-proclaimed "Oberdada", whose writings merited new attention (and editions) in the final decades of the 20th century. 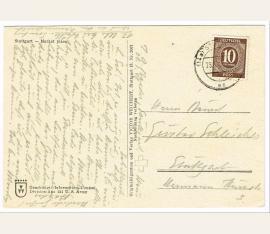 - Letter and first typescript have punched holes; paper somewhat brittel as usual, otherwise well-preserved..
Architekt, Dichter und Dada-Künstler (1875–1955). A.P.S. Stuttgart. 1 S. Qu.-8vo. Mit eh. Adresse. 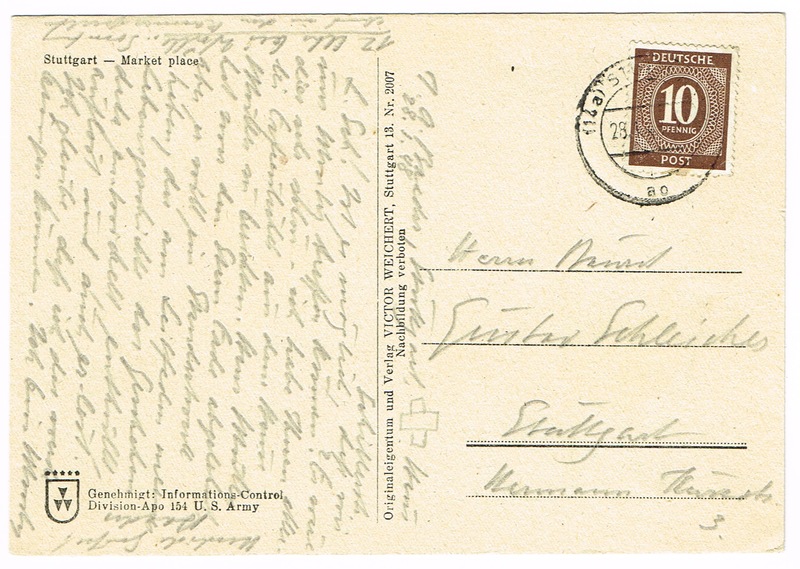 To Gustav Schleicher in Stuttgart: „Is it possible that we meet on Monday? It would be very nice - I have to rport you a lot of good news about Müller. Hans Müller refused „Stern Erde“ but we wants to have a standard work, that develops, unveils, dissolvs, and redeems on my biography the movement dada. I am very positive that I could give him that information. Ist es möglich, daß wir uns Montag treffen können? Es wäre dies sehr schön, ich habe Ihnen allerlei Erfreuliches aus dem Hause Müller zu berichten. Hans Müller hat zwar den Stern Erde abgelehnt, aber er will ein Standardwerk haben, der am Leitfaden meiner Lebensgeschichte das Geschehen dada entwickelt, enthüllt, auflöst und auch er-löst. Ich glaube, daß ich das voranbringen könnte [...]“. - Die Bildseite mit einer Ansicht vom Stuttgarter Marktplatz; in Bleistift..